Check out some really cool Nasa shuttle memorabilia and collectables. Space Shuttle Orbiter Collection 1/144This beautiful, newly released set, includes all 6 Space Shuttle Orbiters. They are exquisitely presented on a wood plaque, that includes an American Flag and NASA logo. The scale of each model is 1/144.The Space Shuttle Orbiter's individual fleets are named and numbered similar to ships. All orbiters tend to be externally and identically similar, but they have minor internal differences. The Challenger (OV-099) was tragically destroyed after its liftoff in January 28, 1986. The Enterprise (OV-101) was used for test landings. The Columbia which was tragically destroyed during reentry in February 1, 2003. And the other orbiters, Discovery, Atlantis, and Endeavour. This 1/100 high quality Space Shuttle model with full stack features accurate NASA detailing and a stand is included. Stands 25 x 9 inches. This 1/200th scale B747 Shuttle Carrier comes with a stand and features amazing detailing. Stand included and is 12 x 14 inches. This model is not a kit and is already constructed. It is meant for display such as a desk or case. A beautiful edition to the desk of any space fan, this quality Daron model is a 1/144th scale replica of the orbiter with a 6 1/2 inch wingspan. It is approximately 10 inches long. Also available in a 1/200th scale and a 1/100th scale. This model is not a kit and is already constructed. It is meant for display such as a desk or case. Daron replica models are highly respected around the world for their quality of workmanship and for the attention to detail. 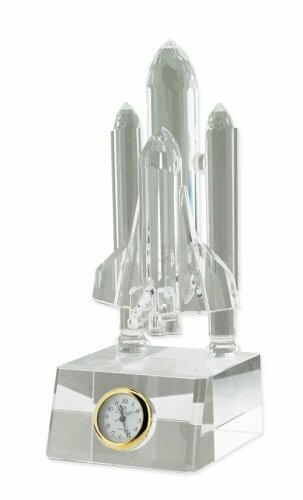 This beautiful crystal space shuttle with a crystal booster rocket attached makes a stunning addition to any home or office. The entire piece stands approximately 5 1/2 inches high and is 2 1/2 inches wide. You may click on the image for a larger picture. The complete set of official Space Shuttle Mission patches. The set also includes the Space Shuttle Program Patch. This set includes all STS Patches from all flown STS missions, beginning with STS-1, through STS-135, a total of 135 patches. Our Space Shuttle Patches are from the Official NASA Space Patch Supplier. They are 4" Patches. Please note on Online Stores DB all The Space Store nasa shuttle memorablia discounts, The Space Store nasa shuttle memorablia coupons, The Space Store nasa shuttle memorablia coupon codes and The Space Store nasa shuttle memorablia promotions are subject to change without notice and should be verified at the merchants site before completing an order! This page shows The Space Store nasa shuttle memorablia. You redeem the coupon or promo by clicking on the link and then entering the coupon code or promo code in the proper spot on the The Space Store nasa shuttle memorablia online site. These offers for The Space Store nasa shuttle memorablia are manually processed and time to time The Space Store nasa shuttle memorablia can be out of date, so please report any occurrences in our contact form. Make sure to bookmark news page: 'The Space Store nasa shuttle memorablia' for the latest updates. At the bottom of any page at this site is a Share Button with many bookmarks, email options and sharing sites. Online Stores DB is not responsible for monetary loss or any other type of injury arising from expiration, cancellation, restrictions or changes in terms of any coupons or promotions; errors or inaccuracies in the content of coupons or promotions; or other use of this site.